There was a time when we had to video call someone, we could only think of Skype. And, we could use Skype mostly on our computers. Times have definitely changed and smartphones have become much smarter. More video calling options have emerged and become exceedingly popular, such as FaceTime. Skype isn’t as popular as it used to be once and yet millions still use it. Wondering what lies in store for Skype and whether FaceTime will eclipse it in the time to come? Keep reading! Not until it goes cross-platform! One of the biggest benefits of Skype is that it is available on almost all the mobile and computer platforms including iOS, Android, Windows mobile, Windows PC, Mac OS and more. FaceTime, on the other hand, is Apple’s baby and the company seems too protective about it. Of course, exclusivity is the part of Apple’s mainstream strategy – develop a great product, keep it restricted to your own devices and compel people to buy devices from you. It has worked very well for Apple and we see no reason why it should not in the future. But, whether or not FaceTime will trump Skype in the coming 5 years is debatable. If Apple continues to keep FaceTime exclusive to its own devices, more than billion mobile users will remain deprived of it. Thus, they will have to look for the video calling alternatives in Skype, Duo, WhatsApp, or Messenger. FaceTime may probably outstrip Skype in terms of number of users it will never be able to make Skype totally obsolete – not in the next 5 years or so to say the least. What if Apple devices become ubiquitous? You may ask, aren’t they already? To some extent, yes they are. But, we are talking about putting an iPhone in every hand. There are clearly more Android users than iOS. The reason is very simple. Android phones are available in a very wide range of prices. They have lots of budget phones for those who cannot afford the pricey, premium $1000 devices. You could get an Android device for a price as low as less than $100. Apple has never been keen on introducing the budget phones. Even its cheapest devices are many times more expensive than Android’s. This is again one of their most successful business strategies. There is no denying that Apple products are great. They are far superior to the low-end or mid-range Android smartphones. Apple knows that its products are coveted. This is why it can afford to keep the prices high. Millions of people buy iPhone regardless of the price. But, can Apple surpass the sale of Android devices? Seems unlikely, especially at the price tag they carry. More so because Android has more affordable devices and they also have high-end phones, like Samsung Galaxy S series, which rival iPhones in many ways. Let’s assume that Apple devices start selling more than Android. Even if this happens, Android will still have a fair share of the mobile market. This means, millions of people will still have no access to FaceTime. This also means that they will have to rely on the services like Skype. Now let’s look at the picture from Skype’s perspective. 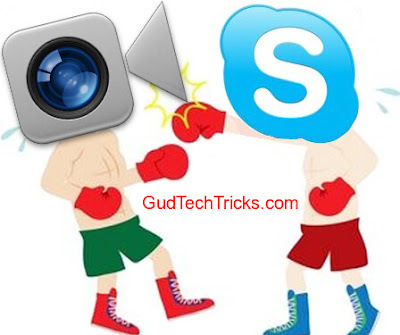 We know that Skype is the name synonymous to video calling, like Adobe’s Photoshop is to image editing. Skype has been the pioneer or VoIP and Video calling. It is used by millions of professionals and individuals all over the world. Skype started out as an independent company, but a few years ago was taken over by Microsoft. So, here’s the thing – will Microsoft let Apple crush Skype in the next 5 years. Well, Microsoft will definitely not take it lying down. Skype has dramatically evolved as a communication tool over the years. It now offers more ease of use, better looking interface, and high quality voice and video calls and great performance. While Apple continues to make FaceTime better, Microsoft will keep working to make Skype up to date with latest technologies. Honestly, there wouldn’t be a lot to choose between the two in the coming time. So, when it comes to technology, quality, and performance, it will be hard to tell which one of the two will have an edge over the other in the time to come. What we need to remember is that Skype is not the only competitor of FaceTime. 5 years is a pretty long time. 5 years ago, most people only knew Skype. Today, we have FaceTime, Duo, WhatsApp, Messenger, Kik and many other messaging applications. So, 5 years down the line, a new video calling app may enter the market and probably oust all the existing ones. How to Convert DVD Video Files to MP4?